I went to hike at Alta ski resort in Utah, US with my wife. An incoming storm was coming and after returning to our car in the parking area the sky was covered in storm clouds high winds and snow started. A break appeared in clouds with the sun appearing in the edge. I saw a stationary brilliant blue image (blur) in the middle of the storm cloud deck and took out my cell phone (galaxy s6) to capture it thinking it was a sundog reflection on clouds. I shot the picture through the sunroof enlarged it and saw the blur was two orbs with similar lighter appendages. Next I stepped out of the car to look to see if it was due to the polarized sunroof, but it was not. It was still visible to the naked eye. The objects seem to have caused a shadow image in the sky some distance between itself and the camera. The orbs remained visible for about 45 minutes till the gap in the clouds covered it completely. The storm front was moving from west to east with wind gust to 50 mph a ground level these objects seemed unaffected by the storm and were stationary even though the wind was likely much greater at the altitude it was observed at. The image was taken last year on March 12, 2016. Mufon case 83502. KEN’S NOTE: I HAVE SEEN THIS KIND OF PHOTO MANY TIMES BUT NEVER IN A DOUBLE ORB. 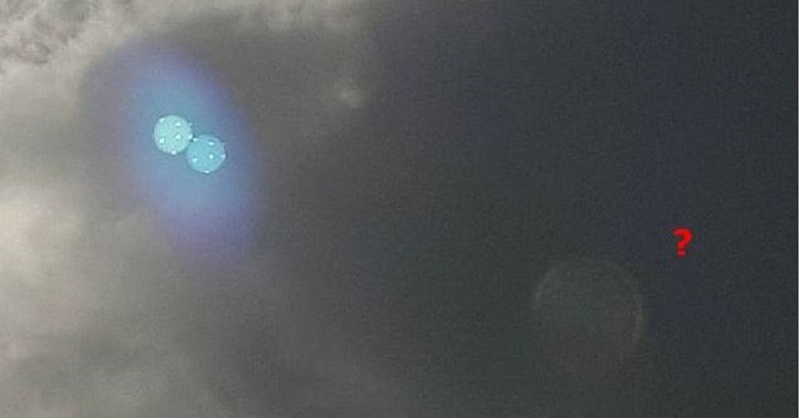 WE HAVE BEEN CLASSIFYING PAST CASES AS LENS FLAIR BY THE SAMSUNG CAMERA BUT NOW I AM NOT SURE IF THOSE LENS FLAIR PHOTOS WERE REAL ALIEN CRAFT. 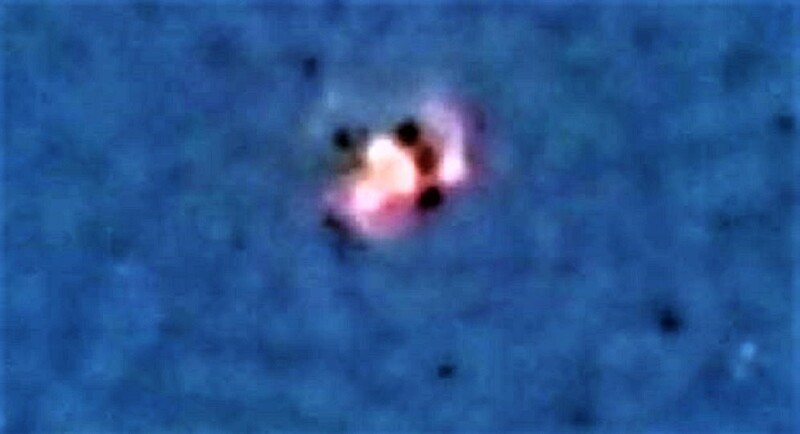 WITNESS CLAIMS TO HAVE ACTUALLY SEEN THIS OBJECT IN THE SKY. 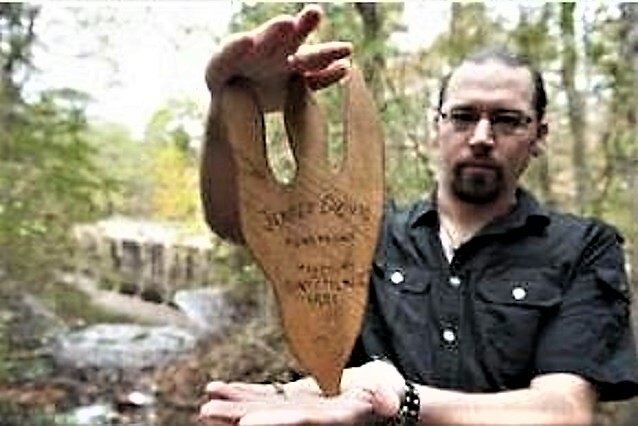 “We were all terrified,” admitted Dennis Kiteveles, a police dispatcher, who with his family watched a UFO from his home in Van Buren, New York for 15 minutes. Shortly after 10 pm the lights suddenly went out in Van Buren for several seconds. Then Kitevele’s coonhound began to howl “very, very strangely. It was completely different from his normal howl, like he was in pain. 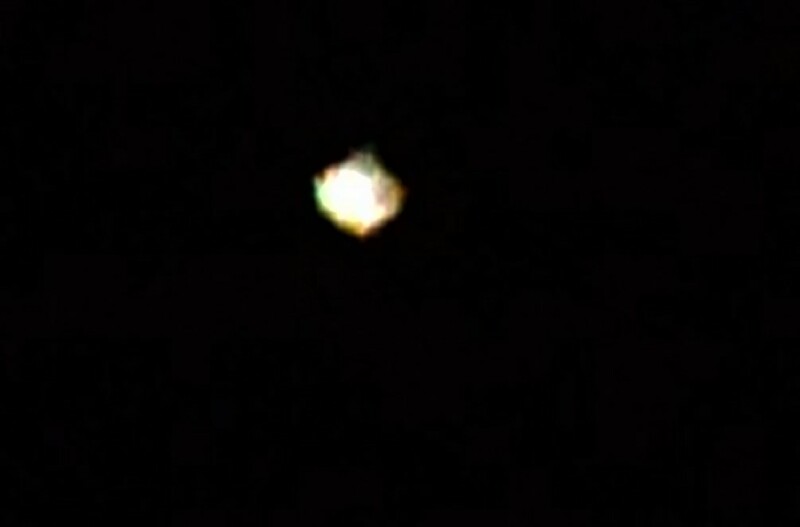 I looked out the window and saw this object hovering about 2,000 feet from the house, very large and roughly oval in shape. It had to be bigger than a 747 jumbo jet and looked like two pie tins, one on top of the other,” Kiteveles said. The sheriff’s department sent a helicopter to the area but could not find the UFO. Helicopter pilot Sgt. Paul Zemenz said “We contacted Hancock Airport and they admitted having an unidentified object on their radar.” The next morning Kiteveles’ wife discovered that despite the power failure the night before, the electric clocks in her home had actually gained over three minutes. NOTE: The above image is CGI. 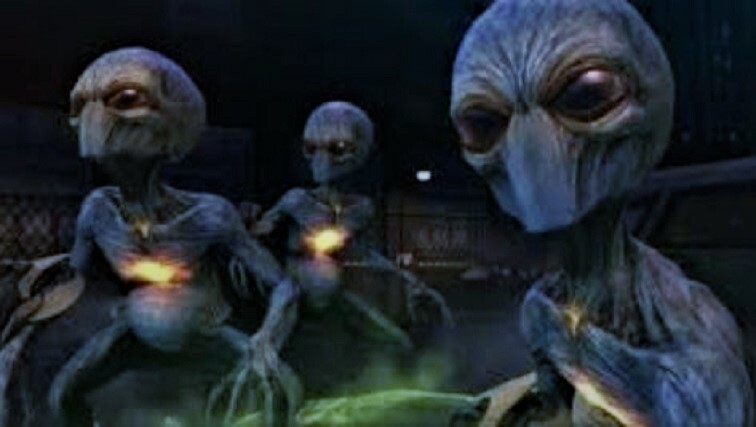 THANKS TO WWW.MUFON.COM CASE FILES and Roger Marsh. The witness called the day after his family experienced a terrifying encounter with unknown entities. He left a voice message. I later called him and conducted an interview. A clip of that interview can be heard above. The family was traveling north on Highway 283 (see map) and ran out of gas. The witness’s wife, brother-in-law, 2 year old daughter and black labrador dog were in the car. They immediately noticed at least a dozen light blue or white lights that “appeared to be playing leap-frog” to the northwest. The witness flashed his lights and the lights immediately moved closer to his vehicle. There was one large light and several smaller lights. Then a bright flash occurred near the car. 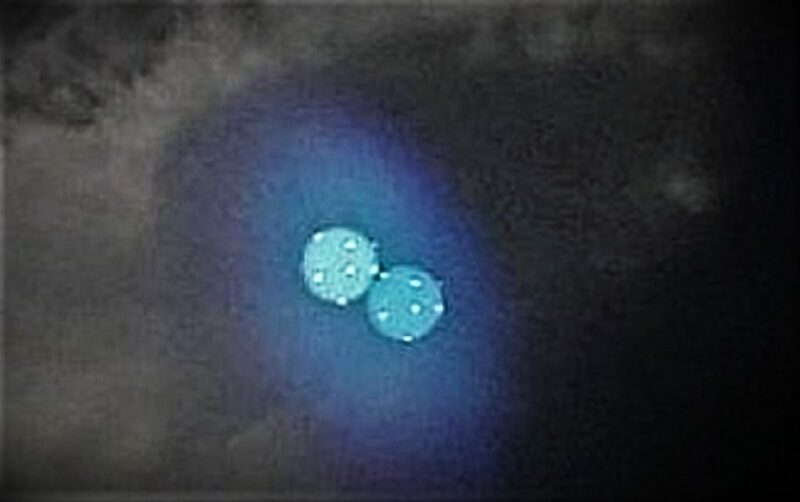 The next thing they saw were 3 entities in a nearby field with glowing blue heads and they were dressed in a type of robe. The entities began approaching the car. The family feared for their lives. The witness called the Sheriff’s office in nearby Norton. The dispatcher answered, but had trouble following the witness’s conversation. The cell phone then went dead and the call was dropped. About 10 minutes later the dispatcher showed up. At that point the entities disappeared. The wife of the witness called her mother who later came with some gas. They traveled into Norton and filed a report with the sheriff. Description: I went out on my deck to have a cigarette. It was 10 degrees F with a cold 10 MPH breeze. The sky was clear and stars were everywhere. 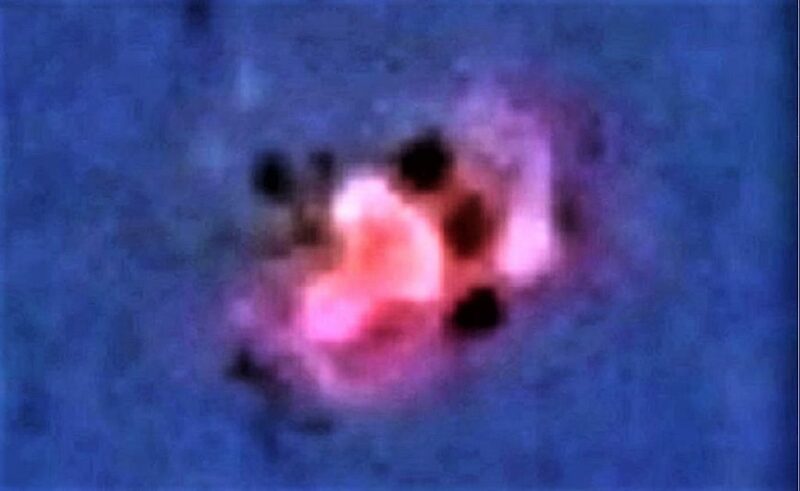 As I looked in an east-northeast direction at about a 25 degree angle a bright object with unusual lights got my attention. I distinctly saw a three dimensional object with colors on each point. It was an icosahedron. I had to look it up. (An icosahedron is a regular polyhedron with 20 identical equilateral triangular faces, 30 edges and 12 vertices.) It is one of the five Platonic solids. It has five triangular faces meeting at each vertex. Each edge on the shape almost appeared to be lighted as the ambient light reflected off the surfaces. On every one of the vertices there was a colored light, one of four colors in no particular order. The colors were blue, orange, red and yellow. The object did not appear to be moving nor did the lights blink. I got my Nikon D-50 with a 500 mm lens and set it on a tripod. The view finder confirmed what I saw. Unfortunately the camera wouldn’t capture the image in auto mode. In manual mode, I got some images using about a one second exposure. They are not the best, but one image does validate what I saw. As far as the other image the appearance could be due to camera movement? I don’t have a clue. “I’m Mike calling from Galloway Township in New Jersey. I got a weird story. I’m a police officer and Galloway Township is kind of a rural area. We’re on the outside of Atlantic City. We were dispatched…this was back in October. I don’t know if you have ever heard of the Jersey Devil. It’s like an old wives tale. I never encountered it myself but back in October in the early part of the month, around midnight, we got dispatched to a motor vehicle accident on Route 9 which kind of connects to Garden State Parkway which loops around to Atlantic City. We get out there and the car is in the middle of the road. It’s a Nissan Altima and it’s got significant front end damage. The driver’s in kind of a daze. He and his wife were in Atlantic City and they thought they had hit a deer. Now, the damage to the car is not conducive with a deer. Me and the other officer that responded, we looked, but we could not find a deer. And while we’re there, and I’m a cop for like 23 years, I just got this foreboding feeling like I’m being watched and I swear I could hear a grunting noise. The damage to the car was significant. We loaded it away, it went on a flatbed. It was like it hit a fixed object. If a car hits a deer, you normally see like deer blood in front of the car or it goes up and over the hood or cracks a corner panel or something, but this looked like it went right into a pole. The guy said, he didn’t see anything. He just remembers hitting something. And the two odd things, he was going north on Route 9 but the car was almost facing the southbound, almost like it had pivoted around whatever it had hit. The next day, the officer and I who investigated went out on the early part of the shift before the sun was set and we searched the area. We couldn’t find anything but I swear as we checked the sides of the road, like the treeline, off of Route 9 going into the tree-line, I swear it almost looked like Ostrich footprints. I mean, I’m looking at them going, ‘Mark, this is too big. This is not a deer print. And it’s not a man’s print’. It’s like an Ostrich and that’s not indicative of this area of South Jersey. So we started talking back at the station that this might have been the Jersey Devil. We never saw anything. We were spit-balling later back at the station, like what did this guy hit? NOTE: The top image is CGI. 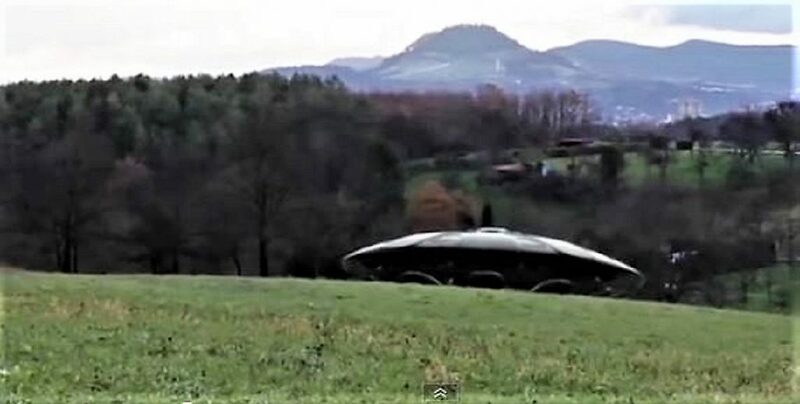 Mrs. Raymond Stucker was driving near her home in Ellsinore, Missouri about 11:30 am on the 6th when she saw a large, metallic colored, disc-shaped object either landing or taking off from a grove of trees off the highway. The object was described as circular with a band around the center and a domed top with porthole-like openings. Landing pods or stilts protruded from the bottom of the craft. It made no noise as it hovered in the air. Several investigators went to the area and located several trees that had been damaged. They also discovered three holes in the ground set in a triangular pattern. Three trees were damaged next to the area where the holes were found. The three holes were about six inches deep and two to three feet across. Of the three damaged trees near the holes, one was split down the center and splintered to pieces, another had the bark stripped down one side of it about 40 feet high. A third in the triangle had only a small amount of bark torn off at the trunk next to one of the holes in the ground. Several other trees were damaged within the triangle which was estimated to be about 50 feet between points. NOTE: The above image is CGI. On the 16th Henry Ford II was aboard a Ford company plane, a Jet-Star, with several other company executives. They were flying at 35,000 feet en route from San Antonio, Texas to Detroit, Michigan. Near Austin, Texas the pilots sighted a huge, round object overhead. Because of its size they first thought it might be an unusually large research balloon. Then they realized it was moving with them. After checking for a few minutes they found the unknown object was apparently pacing the jet, matching its ground speed of 535 knots (616 MPH). “It looked twice the size of a DC-8,” the senior pilot reported. “Our guess was 500 to 600 feet in diameter. There were no protrusions or windows. All the passengers saw it, but no one could identify it.” Mr. Ford confirmed the sighting to the Detroit News. 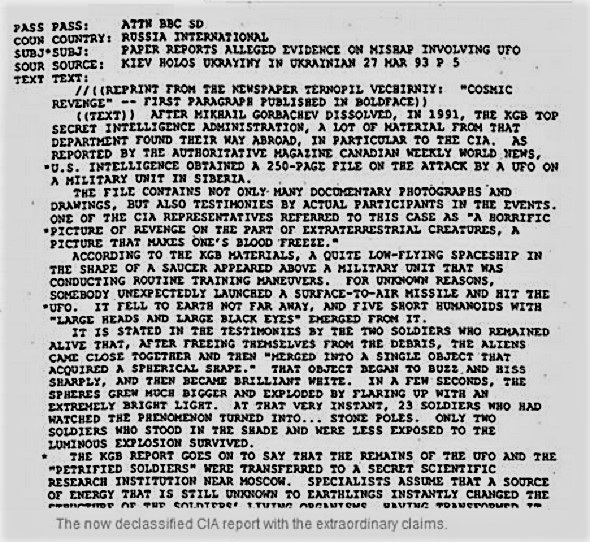 The UFO, he said, had paced the Jet Star for at least an hour. NOTE: The above image is CGI. 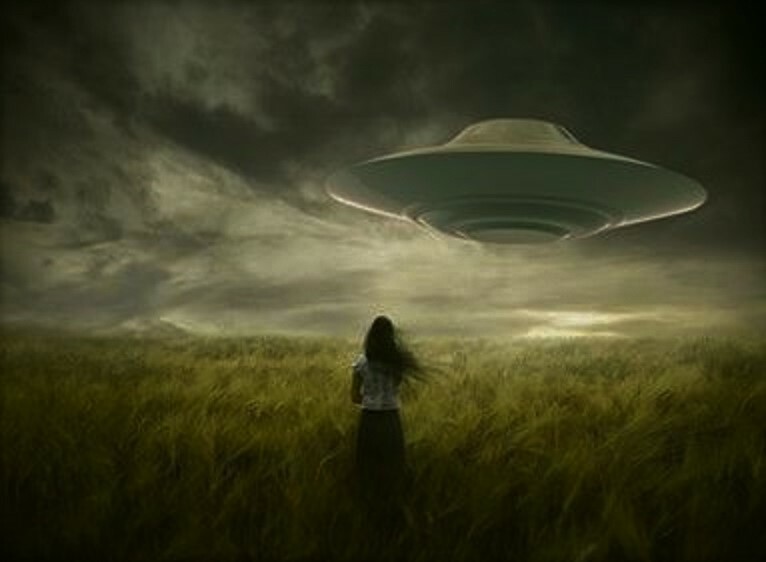 During the week of the 28th there were several UFO incidents in the Selah-Yakima, Washington area. 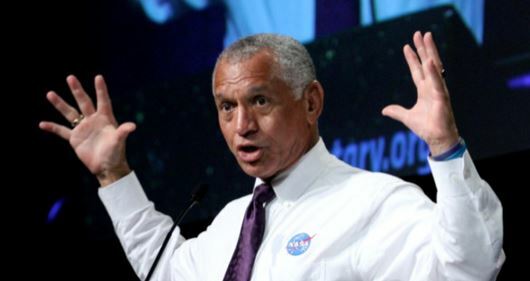 On one occasion a large UFO was observed launching five smaller objects which moved away from the area at high speed. Later that evening a 16- year-old boy was driving in the same area when he noticed a light off to his left. He stopped his car for a better look and was astonished to see three “beings” emerge from a wooded area and approach his car. He said they appeared to be wearing orange-colored clothing of a shiny texture. The beings were human-like in appearance and four feet tall, or less. There was no hair or other covering on the heads. The boy began honking the car horn in an attempt to frighten the beings away. Then two similar beings emerged from the right side of the road and came toward the car. According to the witness the beings had approached to within 25 feet when they suddenly turned around and walked back to the wooded area. The next morning investigators found six imprints in the soil which resembled foot prints. They were eight inches long, had a narrow heel, no instep and a “paddle-shaped” foot. NOTE: The above image is CGI. Message: I live in Hillsboro, sightings happen here all the time and have for years, especially the late 70s and early 80s. I lived on a mountain for 15 years with a clear view south, saw some weird stuff. 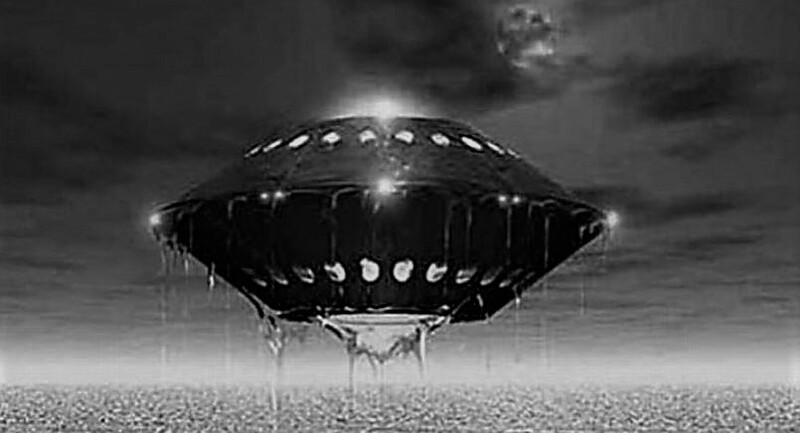 I have seen the lights you speak of, some of my friends have seen dirigible shaped objects and some very trustworthy and respected people claim to have seen aliens themselves, but no one wants to talk about it. I would like to hear what others have seen. 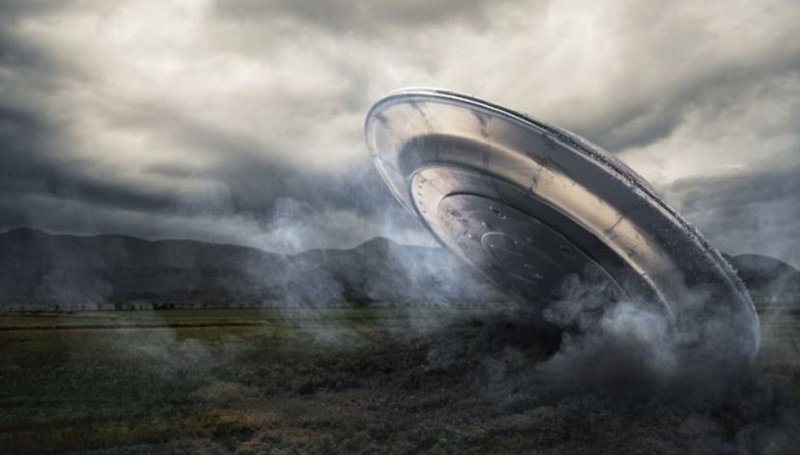 A Beausejour, Manitoba, Canada man was badly shaken by his experience on the 3rd after a large UFO followed him in his truck to his home. John Kryschuk said the object was some 40 feet in diameter at the bottom and about 30 feet high. As he drove south along P.T.H. 12 at 11:30 pm, he noticed a light shining on the highway from above his moving vehicle. “I stopped my truck,” said Kryschuk, “looked up and saw a big light about 400 feet above the highway and hovering above me.” He said the light was on the bottom of the craft and he could hear a loud humming sound. Some seven bands of different colored lights were spinning around the object as though they were on belts. Kryschuk said he watched the object for some 10 minutes as it hovered above the highway. Then, he said, he got into his truck and drove to Beausejour. 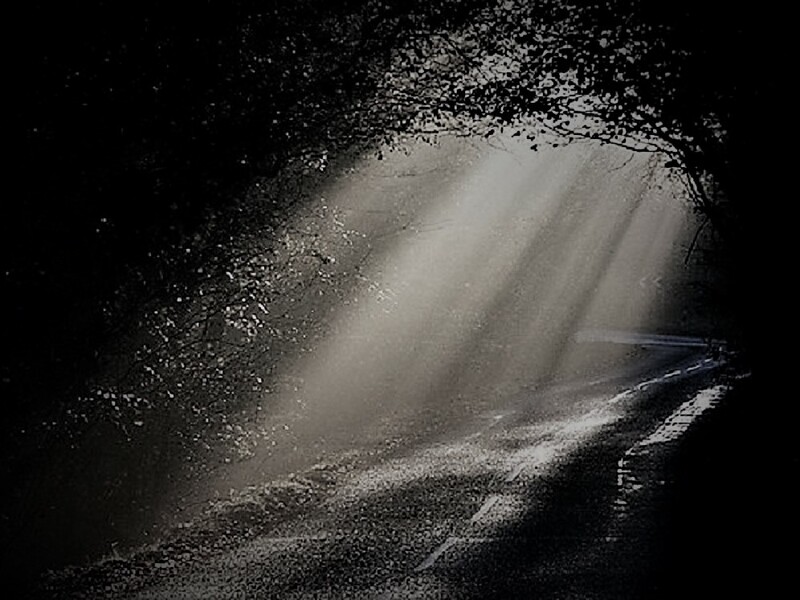 He was shocked to find that the object followed him the remaining four miles, shining such a bright light onto the highway that he said he need not have used his headlights. He said the object suddenly went up and into the southwest like a bolt of lightning. NOTE:The above image is CGI. My younger brother and I were riding our bikes to town as we did every Saturday to visit friends. We pass a horse farm on the way. As we came around the corner we heard a humming nose and looked in the direction. In a small corral there was one horse and a few feet above it was a disc shaped object approximately 12′ by 10′. It was grey in color with no visible openings. As we were trying to figure out what it was we observed 3 tube like arms come out of the sides and one end, all the tubes had 3 pincers on the ends. As this was happening I got really afraid and turned and told my brother we needed to leave. (I was 13 years old and he was 10) I don’t remember looking back at the object. We headed to town and and our first stop was always to stop at the town store to get snacks and drinks. I also always check the clock to see what time it was. When I looked at the clock out was 2 hours later than it normally was when we would arrive. Again I felt afraid because it didn’t seem like we spent that much time looking at this object. I told my brother we couldn’t stay long because it was almost time to head back. When we started heading back once we got closer to the farm I again had an overwhelming fear come over me. When we reached the farm the horse was laying on the ground next to the far end of the corral. When I observed it earlier during the sighting it was in the middle of the corral. I knew that the horse was in trouble. 2 days later I was going to school and asked my friend who lives on the farm if the horse was okay. He didn’t know about it so asked his father later after school. The next day he yells at me and wants to know how I knew about the horse, so I told him what we saw. He then told his father what we said and his father told him he was not allowed to talk to us anymore. NOTE: The above image is CGI. At 6 am on a beach in northeastern Brazil, several witnesses observed a strange UFO descending from the sky from the direction of the ocean. They could hear a humming sound as the craft approached. When the object was at a distance of about 40 meters and about 15 meters above the water, it began to rock sideways and then became stationary. Described as being very large, the craft was shaped like two bowls placed together rim-to-rim. The top half was aluminum color with a small dome. The bottom half was dark in color. There was a band around the area where top and bottom sections met. The band had a number of square openings which were illuminated by a red light. The openings facing the witnesses were darkened as though someone was looking through them. Directly under the object the water seemed to be boiling or being sucked up without touching the underside of the craft. The UFO was watched for about an hour. NOTE; The above image is CGI. Hi Ken : I was sky watching when I spotted a passenger plane that was approaching. I started watching the passenger plane as it flew across the sky. I then started taking photographs of the plane with my Nikon P900 Camera. It was then I spotted an object that was directly in front of the passenger plane. The object was a violet colour and definitely had structure to it. There appeared to be what at first I thought were round black windows on the object but I then realized that they were in fact individual black objects moving around the outside of the object. Very strange indeed. 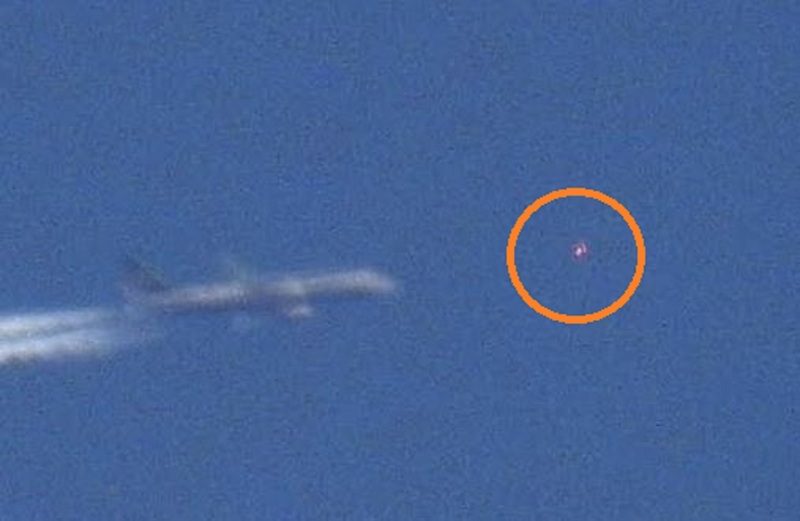 I quickly took a photograph and managed to capture the strange object right in front of the passenger plane. After taking the photograph I continued to watch as the unknown object matched the planes air speed and stayed in front of the passenger plane for a while before moving off and disappearing from sight. 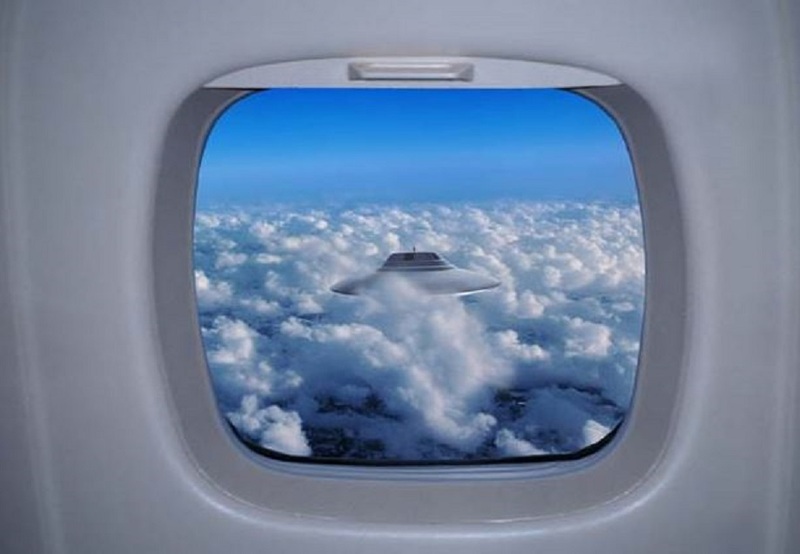 The passenger plane pilots must of seen this object through the cockpit window. The pilots made no attempt to change course or avoid the object that was directly in front of them. The pilots must of known or been told that the object would not collide or pose any threat to the plane. I only wish the pilots would come forward and tell the world what they witnessed up there. The Photograph was taken on the 16th of April 2017 12:45 PM at Newton Abbot Devon England. All the Best John. 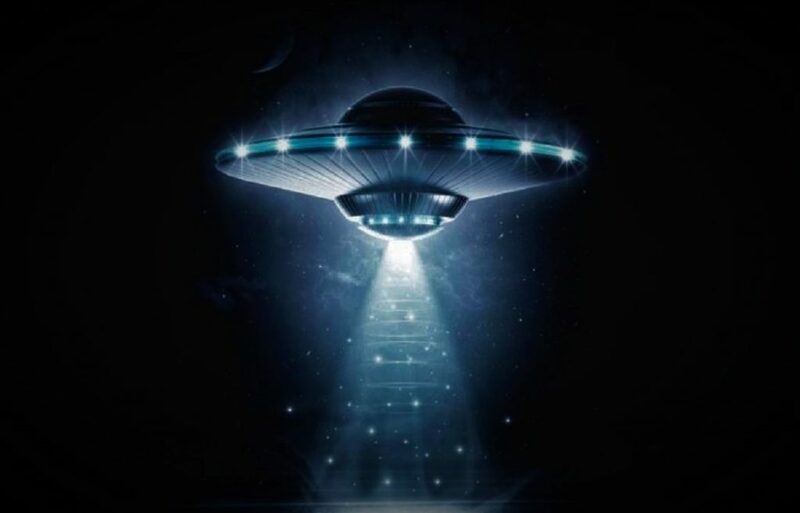 KENS NOTE: John Mooner is an investigator for World UFO Photos and has witnessed countless UFO craft over his home in Newton Abbot Devon England. 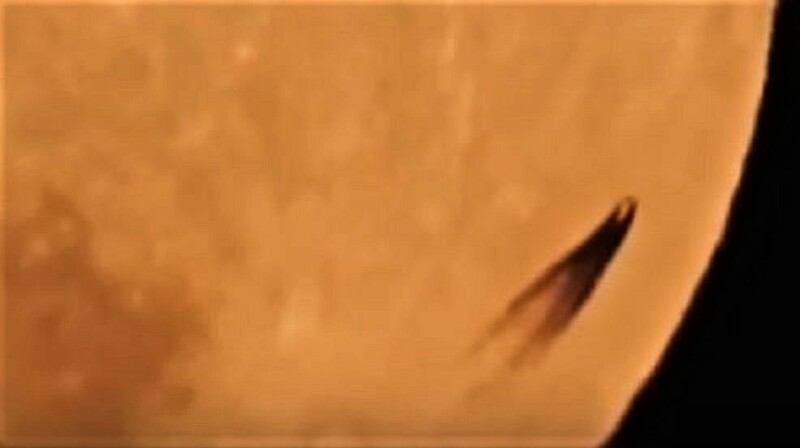 At 3:15 pm on the 12th 10 disc-shaped metallic colored objects were observed near Sweetwater, Nevada changing formation while moving at a high rate of speed at an estimated altitude of 7,500 feet. The discs passed under the right nacelle of a C-47 aircraft and were observed by the pilot and co-pilot. The pilot turned the aircraft in a tight 300 degree turn for a better view of the discs which were then seen by two more members of the crew. Observers were unable to estimate the speed of the discs. On the 15th a mass of mysterious white substance drifted down from the sky over Ongaonga, New Zealand. It covered fields, buildings, wires, trees and fences for hundreds of yards around. The substance quickly disintegrated when handled.